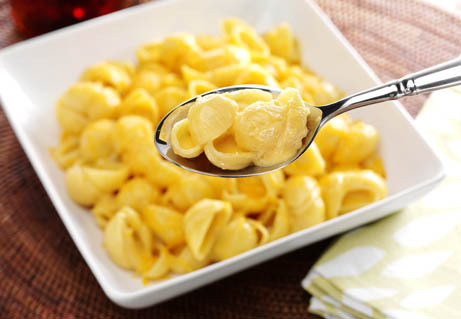 In a medium sauce pan over medium-high heat melt 5 tablespoons of the butter with the salt. Slowly add the milk in about ½ cup aditions, whisking smooth after each addition. Cook pasta according to package to al dente. Drain and add the cheese sauce to the pasta. Transfer to a buttered 8”x 8” casserole dish. If desired, toss bread crumbs with the remaining ½ tablespoons of butter an sprinkle over the top. Bake at 425ºF for 15 minutes or until golden brown on top. Serve hot.